Ten university finalists were selected for the 2016 National Cyber Analyst Challenge (NCAC), a competition that supports top students currently pursuing cyber-related degrees in the nation’s leading programs. Powered by Leidos and administered by Temple University’s Institute for Business and Information Technology (IBIT), the competition sent 10 teams to Phase 2 advanced cyber training and the subsequent Phase 3 finals in Reston, Va., Oct. 27-28. The finalists (in alphabetical order) were: Carnegie Mellon University, Howard University, Iowa State University, Penn State University, Syracuse University, Temple University, University of Maryland University College, University of South Florida, University of Texas at San Antonio, and Villanova University. Each team received an award of $6,000 to $12,000 to support student, faculty, and curriculum development. A panel of industry experts scored the teams on technical proficiency, judgment, and communication. Carnegie Mellon University was awarded $25,000 as the winner of the second National Cyber Analyst Challenge. Developed to enhance the skills of the future workforce and inspire students to pursue careers in cyber security, the National Cyber Analyst Challenge focuses on developing strategic skills involving analysis and threat identification. “Our nation and our very way of life is under constant attack in cyberspace,” said Chris Kearns, senior vice president of enterprise and cyber solutions at Leidos. In its second year, the Cyber Analyst Challenge is a pioneering interdisciplinary competition that includes undergraduate and master’s students studying information systems, computer science, and engineering, and encourages the development of strategic skills involving analysis, threat identification, and mitigation planning. 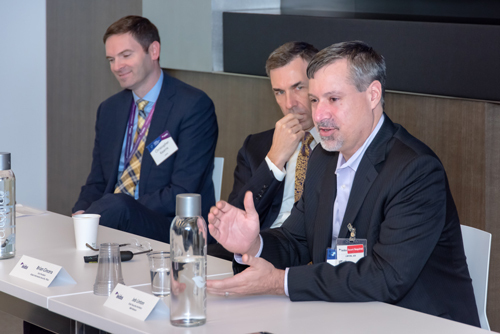 “The demand for cyber professionals with analytical mindsets and strong fundamental skills grows every year and our customers need more students to enter the field and help defend our nation in cyber space,” said Chris Kearns. The three-month, multi-phased competition started with each team analyzing a cyber case. In the second phase, the teams received training from industry experts. Participating universities fielded teams of four to five students, and a faculty advisor, to analyze a data set. The data set provides the context to a fictitious cyber incident. For Phase I each team submitted a C-level presentation to analyze the incident and provide recommendations. New in 2016, the associated NCAC conference engaged faculty and industry experts on cyber risk analysis, threat identification, remediation, and communication. Presenters discussed cyber research and curriculum challenges and opportunities including macroeconomic, policy, legal, and digital perspectives, as well as curriculum best practices – targeted toward schools interested in expanding their cyber programs. “The NCAC conference provided a unique opportunity for meaningful dialogue between academic, industry, research, and education experts,” added Dr. Munir Mandviwalla, Executive Director of Temple’s IBIT, who worked with Laurel Miller, Director, to envision the competition. One outcome from the conference is the identification of a set of strategies to enhance cyber education and research through data centric collaboration between industry and academia.